Posted July 9, 2015, in Featured News, News, Student News, We R Arts and Sciences Student Spotlight. Computers were a source of wonder for Abhishek Garg ever since he was a child growing up in India. Playtime on the computer – playing games, writing simple texts, painting – fired up Abhishek’s curiosity. How could this seemingly simple machine do so much? This question served as his motivation as he learned as much as he could about computers, which eventually led to his decision to pursue a degree and career in computer science. In July 2006, he entered Uttarakhand Technical University in Dehradun, India, where he graduated with a first division bachelor’s of technology degree in computer science and engineering. After graduation, Abhishek entered the workforce as a system engineer for Tata Consultancy Services (TCS). His work with TCS, which is one of Asia’s largest information technology firms, involved fixing bugs in software and helping with large-scale projects as part of a high-performance team. 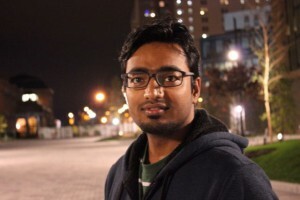 Simultaneously, Abhishek volunteered part-time as a software developer for a US-based firm called Edgesoft, Inc., for whom he automated the process of checking, inspecting, and reporting hazardous material at a location in California for a website called Enterprise Land Management System, used by the city of Glendale. “Edgesoft helped me test my potential, work under a tight deadline, learn everything by myself, and be responsible,” Abhishek says. The teaching and research experience Abhishek Garg, a student in the graduate scientific computing program, gained at Rutgers–Camden helped him land a job as a software developer at Dell Boomi. These work opportunities were certainly beneficial to Abhishek as he developed his career, but he longed for the challenge of learning the latest concepts and technologies. Abhishek, who says “every software engineer has a dream to get a chance to work in the Silicon Valley,” set his sights on attending graduate school in the United States. Rutgers University immediately stood out to Abhishek, because “it’s one of the best in research, has a distinguished faculty, and follows a strong tradition of excellence.” Abhishek was especially attracted to Rutgers–Camden because of its small size. In January 2014, Abhishek began his graduate career in the master’s program in scientific computing. After acclimating to his new environment and schedule, Abhishek took advantage of the many research opportunities available on campus and began work on a project called “Development of a Computational Tool for Forensic DNA Analysis” with Dr. Desmond Lun, Associate Professor of Computer Science and Acting Director of the Center for Computational and Integrative Biology (CCIB). Abhishek’s assignment was to work on an algorithm to calculate the probability of a person to be a contributor in the DNA sample. Due to the project’s overlap with biology, Abhishek faced the challenge of understanding new terminology and technical aspects; nevertheless, he says “I loved working on this project.” He is full of praise for his faculty mentor, Dr. Lun, and for what the project enabled him to do, such as make the project the topic of his thesis and co-author a research paper. Through the Graduate School, Abhishek also received the opportunity to become a Teaching Assistant (TA). “As a TA, I got to understand how it feels to stand on the other side of the podium,” Abhishek says. Initially nervous about his new responsibility, Abhishek says he grew comfortable with the position, in which he mentored thirty-five students for courses like Programming Fundamentals and Object-Oriented Programming. Being a TA was a great leadership experience for Abhishek, and also provided him with financial stability. “I will always be thankful to the Department of Computer Science for providing me with this opportunity,” he says. Indeed, as Abhishek prepares to start a full-time position as a software developer with Dell Boomi in Berwyn, Pennsylvania, he looks back on his time at Rutgers–Camden with a heart full of thanks. “When I came to the United States, I hardly knew [anyone]. But after joining Rutgers–Camden, I got to know so many people from various parts of the world, made so many connections professionally and personally, and now have man good friends here,” he says. In particular, he praises and thanks the members of the computer science faculty for their guidance, patience, and expertise. “Overall my experience as a student and TA was really awesome, and one of the best times of my life,” Abhishek says. Page last updated by Faculty of Arts and Sciences at 1:30 pm February 10, 2016 . This page was printed from http://fas.camden.rutgers.edu/2015/07/09/we-r-arts-and-sciences-abhishek-garg/ at 5:20 PM Saturday, April 20, 2019.